To begin this blog I have chosen to write about Brennivín as a friend brought some to our house as a surprise a couple of nights ago. 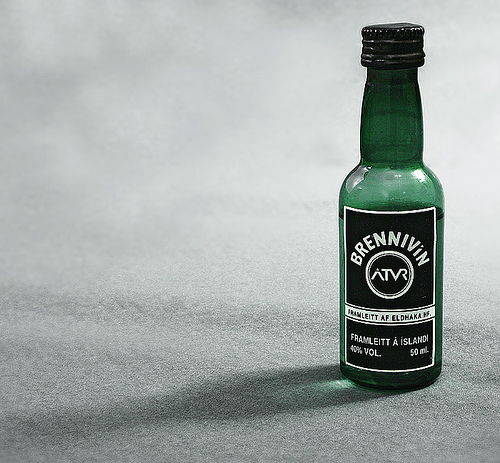 Traditionally served alongside something called Hákarl (a dish consisting of putrified shark that deserves a blog post of its own), its name translates literally to 'burning wine' and it is easy to see how it received such a name. The aforementioned friend told us that it is traditional to drink it to the power of three - I'm not sure whether this is true but I wasn't going to argue. The alcoholic content is 37.5% and it is often referred to as an (unofficial) national beverage of Iceland. 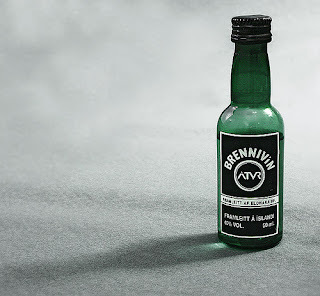 Prohibited between the years 1915 - 1922, it is believed that Brennívin was nicknamed as 'Black Death' and it was during this time that the Icelandic government had a skull and crossbones depicted on the label. 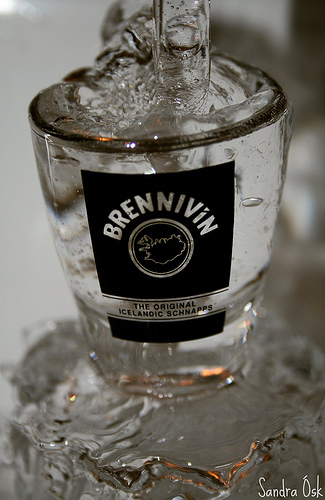 The best way to drink Brennivín is ice-cold, either in chilled shot glasses or poured over ice. However beware of its strong and unusual flavour - it is made from fermented potato and is flavoured with caraway seeds.